If new to ProEssentials, before reviewing this content, please review demo example 000 or one of the Walkthroughs. Next review Chapter 6 Comparison Subsets. You will use the MultiAxesSubsets property to subdivide your subsets among multiple axes. When not using OverlapMultiAxes, only two y axes (one left, and one right) can share the same graph real-estate. When MultiAxesSubsets are defined, resulting (right/left) axes-pairs are stacked vertically top to bottom. We will discuss OverlapMultiAxes later in this section. You first need to understand MultiAxesSubsets before you can use or understand OverlapMultiAxes. Let's start with an example. For example: a graph has 5 subsets and you want to divide these 5 subsets among 3 y axes. 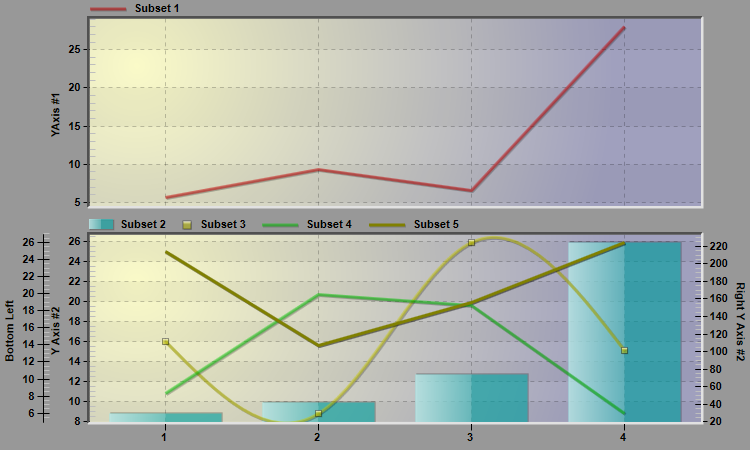 the third and final y axis (bottom) will have 2 subsets. Note that when we add up all the MultiAxesSubsets values (1, 2, 2) they equate to 5 the same value we set for the Subsets property. This should always be the case. To expand on this example, lets make an adjustment so that the middle y axis has 1 subset plotted with respect to the left y axis and the second subset plotted with respect to the right y axis. We also want to label the left and right y axes and plot the second subset as a Bar and the third subset as Points plus Spline. The above code produces the following graph. 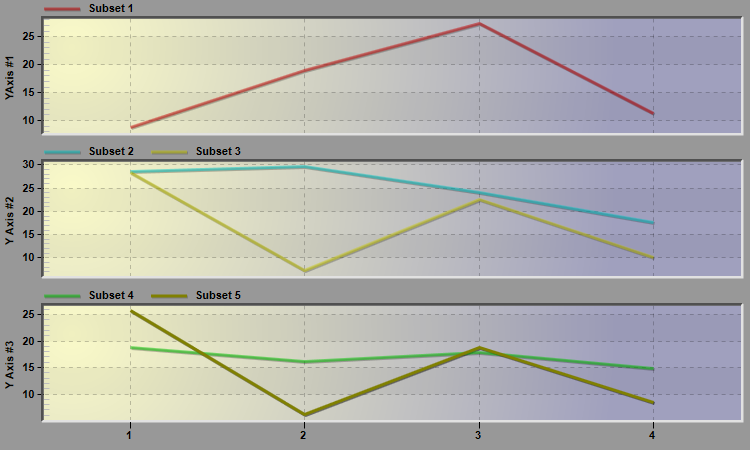 Note how setting WorkingAxis = 1 controls those subsets and y axes defined by MultiAxesSubsets(1). Also note that RYAxisComparisonSubsets no longer represents the number of subsets at the end of data, but the number of subsets at the end of data for a particular MultiAxesSubsets. Note that we use the term middle axis, but in fact, the middle axis has two axes, one left and one right. 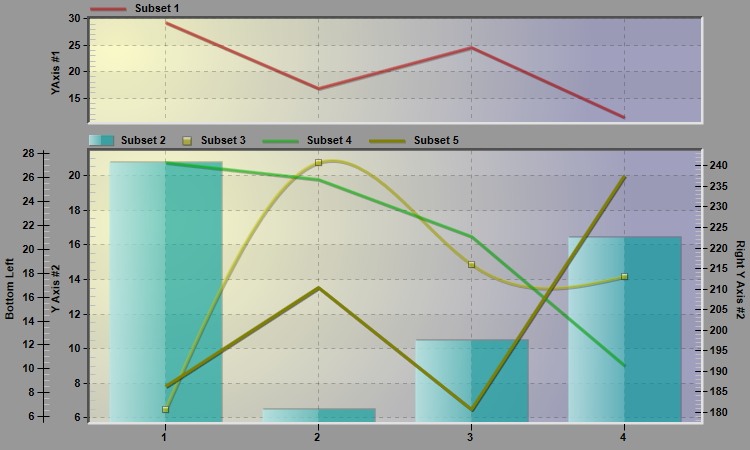 To reiterate, each MultiAxesSubsets is a section of the chart which can contain one left and/or one right y axis. MultiAxesSubsets has a limitation of 16 sections. Each section containing one left and/or one right y axis. Thus, you will only use indices (0) through (15) with this property array. This also means the WorkingAxis property only has valid values between 0 and 15. Now lets discuss OverlapMultiAxes. This property array lets you subdivide your MultiAxesSubsets as MultiAxesSubsets lets you subdivide your Subsets. 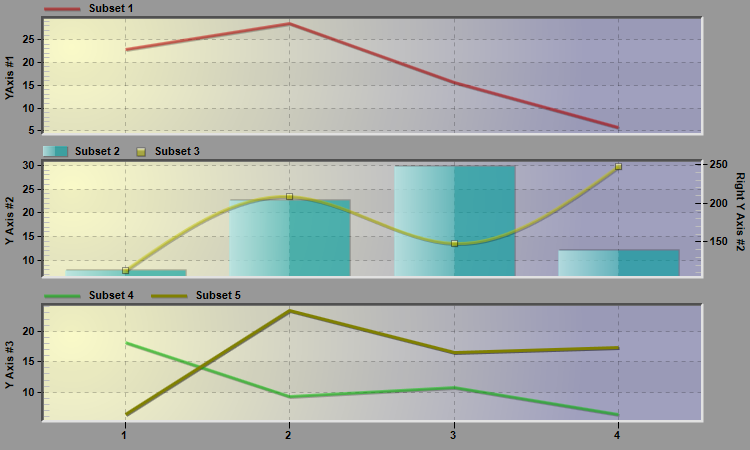 In other words, you can subdivide your MultiAxesSubsets among overlapping multiple axis sections. Like MultiAxesSubsets, these overlapping sections start at the top and grow downward. Again, it's easier to visualize in an example. Lets expand on the above example one more time. This time we want the middle and bottom y axes to overlap, using the same chart real-estate. The above line of code tells ProEssentials that the first overlapping section will have one multi-axis. Thus, there really is no overlapping taking place in this first section. The above line of code tells ProEssentials that the second overlapping section will have two multi-axes. This causes the last two MultiAxesSubsets defined to overlap each other. This should always be the case in your code. Note how the Bottom Left axis is now along side the Mid Left axis, Axis #2. All four subsets making up MultiAxesSubsets(1) and MultiAxesSubsets(2) are plotted in the second overlapping section. One final topic related to multi-axes and overlapping-multi-axes is the property MultiAxesProportions. This property will allow you to control the size of each of the Multi-Axes sections, or Overlapping-Multi-Axes sections. When you are only using MultiAxesSubsets (not overlapping), you define the same number of elements of MultiAxesProportions as used in MultiAxesSubsets. Note how 15 + 35 + 50 = 100. The values of MultiAxesProportions will always add up to 100 percent. When you are using OverlapMultiAxes, then you define the same number of elements of MultiAxesProportions as used in the OverlapMultiAxes. First ignore OverlapMultiAxes and MultiAxesProportions and initially implement only MultiAxesSubsets. After you have all the individual axes looking as desired, then add the OverlapMultiAxes property to overlap the desired axes. Finally, if needed add MultiAxesProportions to contain the same number of elements as OverlapMultiAxes. Note that when implementing MultiAxesSubsets, the subsets have to be in the order that you want them allocated to axes. The same goes for OverlapMultiAxes and the axes have to be in the order that you want them allocated to overlap.